1. Put the basil, pine nuts, garlic, parmesan and lemon zest in a food processor (or use a pestle and mortar); season and blend to a coarse paste. With the motor running (or while pounding), gradually pour in the olive oil and lemon juice until smooth. Taste and season again, if needed. 2. Serve stirred through tagliatelle or with homemade gnocchi, if liked. 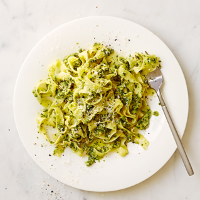 Store leftover pesto in a clean, sterilised jar in the fridge for up to 1 week.